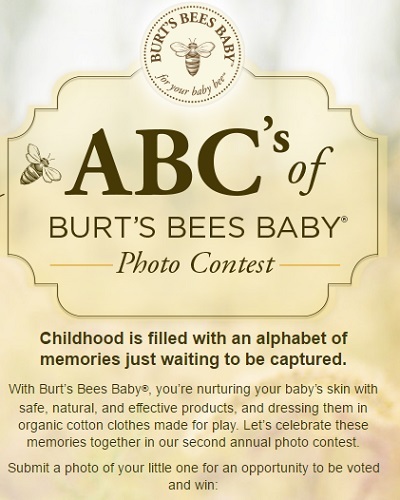 Enter the ABC’s of Burt’s Bees Baby Photo Contest and you could win an epic $5,000 and more! Childhood is filled with an alphabet of memories just waiting to be captured. With Burt’s Bees Baby, you know you are nurturing your baby’s skin with safe, natural, and effective products, and dressing them in organic cotton clothes made for play. As a person with sensitive skin and skin problems, I am a massive fan of organic cotton clothes for big and little kids alike. 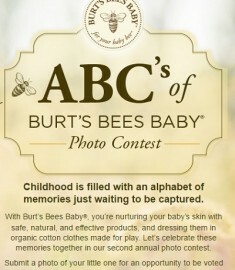 It is time to celebrate these memories together in Burt’s Bees second annual photo contest. Photo contests are always a fun way to get the creative juices flowing! To get an entry, submit a photo of your little one for an opportunity to be voted and win. The submissions will be voted on as follows: Votes Received (10%); Creativity/Originality (25%); Quality of Submission (25%); and Fit to the Contest Theme (40%). One grand prize: A $5,000 check; $2,000 Target gift card; and $300 of Burt’s Bees Baby Products. Approximate Retail Value: $7,300. Child must be 36 months or younger. See all the contest information about how to submit the photo and all the requirements. 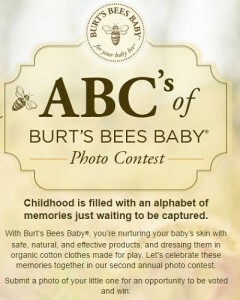 Burt’s Bees Baby collection is amazing and well worth checking out!